TWO Abu Sayyaf bandits were killed while another was captured in separate clashes in the provinces of Sulu and Basilan. Colonel Gerry Besana, Western Mindanao Command (Westmincom) information officer, said no casualty was reported on the government side in both clashes. The Abu Sayyaf bandits are on the run. Besana said the first clash broke out around 11:44 a.m. Monday, March 18, on Simusa Island, Banguingui, Sulu when the troops from the 21st Marine Company of the Marine Battalion Landing Team-1 (MBLT-1) chanced upon a group of Abu Sayyaf bandits while conducting focused military operation on Simusa Island, Banguingui. 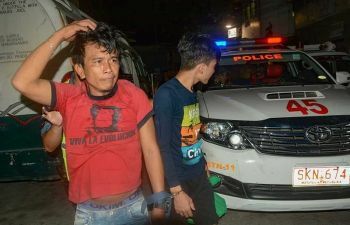 Besana said the firefight lasted for about five minutes after which the Abu Sayyaf bandits fled, leaving behind two of their companions. One was dead while another was wounded. He said the slain Abu Sayyaf bandit was identified as Hamza Hamad, 19, a resident of Sirawai, Zamboanga del Norte. The remains were taken to the MBLT-1 command post for proper disposition. Bautista Station Hospital for treatment and debriefing. Another firefight erupted and lasted for about three minutes as Marine soldiers pursued and caught up with the fleeing Abu Sayyaf bandits in Sitio Mono-Mono, Simusa Island. The bandits were still on the run. Besana said Mohammad disclosed during his debriefing that they were led by Najir Arik and that they were running out of food supply and ammunition. Colonel Fernando Reyeg, Army’s 104th Infantry Brigade commander, said another clash ensued as troops from the Army’s 18th Infantry Battalion chanced upon 10 Abu Sayyaf bandits led by Furudji Indama in the village of Bohe Pahu, Ungkaya Pukan, Basilan. Reyeg said an Abu Sayyaf bandit was killed. The troops recovered an M-16 Armalite rifle from the clash site. Reyeg said that another firefight ensued around 8:30 a.m. Tuesday, March 19, in the same village between the troops of the Army’s 3rd Scout Ranger Battalion and seven Abu Sayyaf bandits who are also allegedly followers of Indama.